President-elect Donald Trump’s announcement Wednesday that he’ll transfer management of his business empire to his sons — but will not divest the assets — won’t ease concerns about his conflicts of interest, say legal specialists. During a long-awaited press conference on Wednesday, Trump said he would put his business holdings, from golf courses and hotels to skyscrapers, into a trust and will stop talking to his children about the company he has spent his life building. The trust won’t be blind, meaning Trump will still know what he owns, and his family will remain deeply involved in his business. That’s at odds with the advice of ethics lawyers and defies the norms set by most modern presidents. Sheri Dillon, a lawyer and tax adviser to Trump who spoke at the press conference, said it was not feasible to sell Trump’s vast holdings, which she compared in scope to those of Vice President Nelson Rockefeller’s in the 1970s. She also said it was not possible to find a trustee capable of managing the business on the family’s behalf. Dillon said a “totally blind trust” is unworkable, since the trust will continue to hold the businesses Trump knows well. Trump “cannot unknow he owns Trump Tower,” she said. In blind trusts, federal officials hand over their assets to a trustee to be sold, to avoid conflicts of interest. The assets are reinvested in bonds, stocks, and other securities, outside the officials’ view. US presidents and vice presidents, however, are exempt from the conflict-of-interest rule. Dillon said the Trump Organization will be overseen by the president-elect’s sons, Donald and Eric, along with the company’s longtime chief financial officer, Allen Weisselberg. 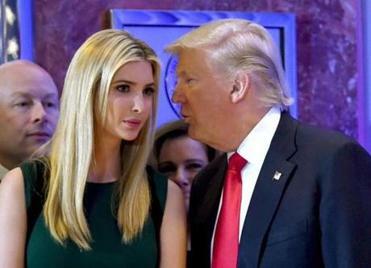 Separately, Trump’s daughter Ivanka said she will take a “leave of absence” from the Trump Organization and from the fashion business that bears her name. Her husband, Jared Kushner, is a newly named senior adviser to the president-elect. The billionaire president-elect is in a different category than any of his recent predecessors, ethics lawyers say. Not only will he be aware of the potential impact his policies have on his holdings, but his global brand will likely benefit from his status as president. Harvard’s Tribe, a constitutional law professor, said Trump’s trust plan still allows foreign governments to curry favor with the president and enhance his wealth, in violation of the Constitution’s emoluments clause. This is a provision that bars presidents from receiving funds from foreign governments. “Everyone in the world knows when they play golf at one of his courses or pay a lot of money at one of his hotels, that they are benefiting him and benefiting his brand,’’ Tribe said. Dillon said paying for a hotel room “is not a gift or a present.” But to sidestep concerns about the emoluments clause, she said, Trump will donate any money that foreign officials spend at Trump properties to the US Treasury. She also said that the Trump Organization recently cancelled 30 pending deals, costing the family “millions,” and that it will not initiate new foreign deals while he is in office. Trump on Wednesday said he turned down a $2 billion deal in Dubai over the weekend, even though he was not required to do so. “I didn’t have to turn it down, because as you know, I have a no-conflict situation because I’m president,’’ he said. Trump will “sharply limit” his right to information about his company, Dillon said. However he will still be able to see profit and loss reports on the enterprise as a whole. Trump plans to resign all positions with the company and said he will no longer discuss business matters with his children. But Christine Fletcher, a trust and estate specialist with the law firm Burns & Levinson in Boston, said Trump should divest of his assets. She also dismissed the idea that he will stop talking to his family about the business.